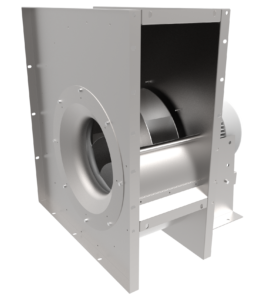 Our supplier partner, Rosenberg, has developed high efficiency centrifugal fans ideal for the movement of clean or slightly dusty air, gases or steam. The ERND/E and EHND/E series offer adaptable, all-round fans that can be used in a huge range of applications, from simple exhausting to demanding offshore environments. Typical applications include the ventilation of workshops and industrial buildings. Axair offer versions of the series that are ATEX certified (explosion proof) that can be used in areas deemed to have a risk of explosion such as, fuel stations or food processing (where flammable ingredients like flour are being used). For more information about which ATEX zones our fans are suitable for, visit our ATEX page. Please note, areas must be zoned by an official ATEX authority. By applying a marine grade coating to the fan, they can be made suitable for harsh, corrosive offshore environments. The coating prevents the effects of handling salty sea air that would corrode a standard, uncoated surface finish. The forward curved impellers of the ERND and ERNE series are made of galvanized sheet steel with plastic inlet cones screwed into the casing. The EHND series’ backward curved impellers are made of aluminium with galvanized sheet steel inlet cones and offer a highly energy efficient solution. All four series of fans use IEC motors. These motors are characterised by a compact, robust design and are controllable in combination with variable frequency drives. IEC motors are more commonly situated outside of the airstream so can deal with higher temperatures than motors that sit in the airstream (for example, external rotor motors). The standard temperature of the ventilated air or gas is -20°C up to 60°C. However, if the motor does not directly get in contact with the hot air, the fan has a resistance of up to 100°C. If there is a requirement of the fan to handle air that is up to 120°C, special measurements of the temperature surrounding the motor must be monitored constantly. To handle colder air than in the standard range, special bearings suited to very low temperatures can be used. This will allow for air handling to a minimum of -40°C. The standard casing is made of galvanised sheet steel with side parts and the spiral plate connected to each other by rivets. With the size 200 fans, the motors are flange-mounted directly. From size 225 upwards, the motors are mounted on a console. A plastic coating is available upon request. The ERND/E and EHND/E series suit a wide range of needs thanks to their efficient design and array of options available on request. 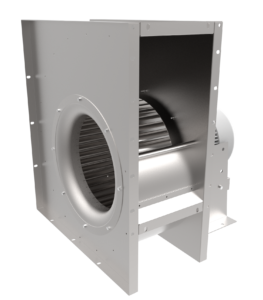 For more information on our range of centrifugal fans, view our product pages, contact our team on 01782 349 430 or email sales@axair-fans.co.uk. This entry was posted on Tuesday, November 13th, 2018 at 3:08 pm and is filed under Applications, Products. You can follow any responses to this entry through the RSS 2.0 feed. Both comments and pings are currently closed.